On Monday night, at a Los Angeles unveiling wryly emceed by Iron Man star Robert Downey Jr., Audi removed the wraps from its latest E-tron concept electric vehicle. 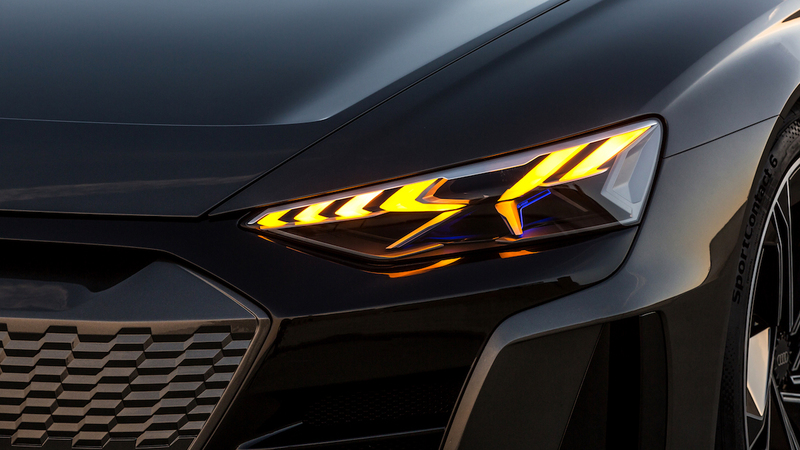 A visually stunning technology and design study, the E-Tron GT foretells a model that will go into series production in 2020 for the 2021 model year. Fender-to-fender with the Porsche Taycan, with which the GT shares technology R&D, and alongside two sister EVs, the GT will challenge Tesla on the ground where the Silicon Valley e-heartthrob first made its bones: the high-performance grand touring car space. The reveal was cloaked in secrecy, intended to keep images of the E-tron GT off the internet before the concept’s full debut at the Los Angeles auto show today. An earpiece-wearing security team in business suits lined the entrance, on guard for errant cameras and applying blackout stickers to journalists’ cellphone lenses. The choice of Downey to host the event was no accident, as Audi’s relationship with Marvel’s Iron Man franchise began with an Audi R8 spotlit in the original, 2008 release. More fittingly, an R8 E-tron concept car appeared briefly in Iron Man 3. 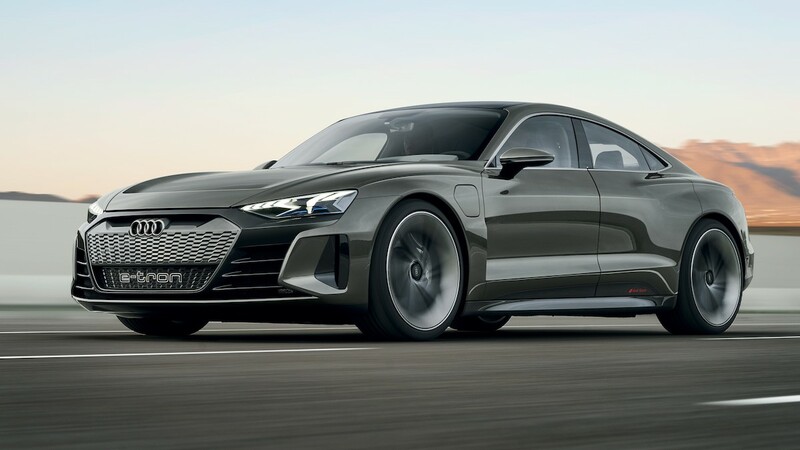 Using EV technology developed in collaboration with Porsche, the E-tron GT will be the first performance-oriented EV to be launched under Audi Sport. 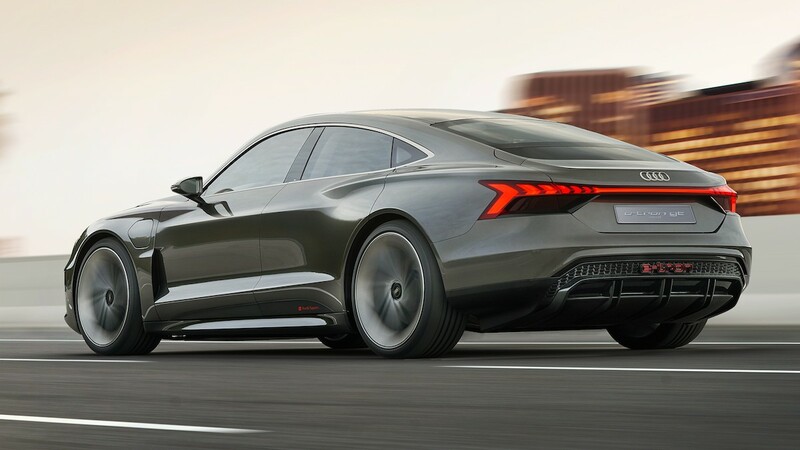 (To better make the point, a press release noted the GT will represent the “future of electric performance for the brand.”) Two axle-mounted synchronous electric motors, placed front and rear, provide a system total of 434 kilowatts (590 horsepower), 235 more than Audi's E-tron SUV announced earlier this year. A yet-unknown quantity of torque is delivered to all four wheels, with vectoring applied front-to-rear and side-to-side. The GT’s specs are eerily similar to those Porsche has indicated for its own Taycan (formerly Mission E). 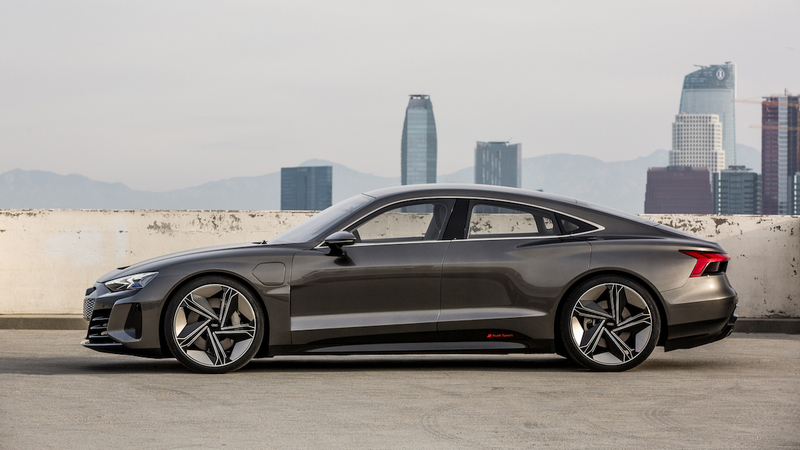 Audi says the GT can get from zero to 60 in 3.5 seconds and to 124 mph in 12 seconds, and tops out at 149 miles per hour. (Porsche says the Taycan will hit the typical 155 mph German-car ceiling) Audi released few details on the suspension, but confirmed the GT has four-wheel steering, presumably derived from Porsche’s rear-steer system. While reports indicate both the Taycan and GT are built on the Mission E’s J1 platform, neither Porsche nor Audi has confirmed the precise similarities between the two cars. Both do acknowledge the two VW Group brands are working together on a new platform, dubbed Premium Performance Electric (PPE). For Audi, that platform will underpin several all-electric model families. Audi says the GT’s range is 248.5 miles, as certified using the new WLTP standard. The lithium-ion battery pack totals 90 kWh, which can be stoked to 80 percent of its charge in 20 minutes via an 800-volt charging system. Naturally, it's compatible with Audi's Wireless Charging, a slower but more convenient induction system for overnight charging. With German automakers recently shamed for unsexiness by Germany's Federal Minister of Economic Affairs and Energy, Audi was obliged to bring the heat. 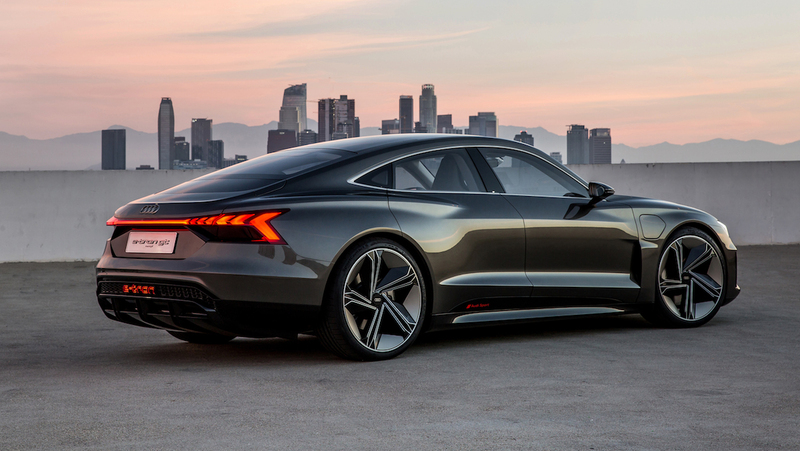 Penned by Audi designer Marc Lichte, the GT is a lithe, unselfconsciously muscular four-door that hardly signals the presence of an electric powerplant. With proportions similar to the Audi A7, the GT is 16.3 feet in length, 6.4 feet wide and 4.5 feet high, with a 9.5-foot wheelbase. The concept's exterior is painted in a color called “kinetic dust,” a warmer version of titanium, with aluminum trim emphasizing various body surfaces. A carbon fiber roof saves weight, while the rest of the body is comprised of Audi's typical combination of aluminum and steel. The EV’s flat floor allows for a low center of gravity. Tires are 285/30s over 22-inch wheels. A version of the typical Audi “singleframe” grille uses a honeycomb pattern similar to the company’s Audi Sport RS models. 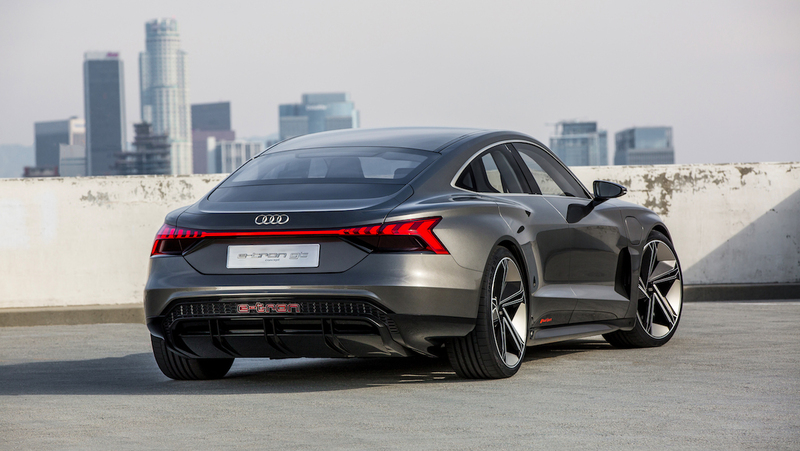 At the front, the GT wears the matrix LED headlights with laser high-beams seen on Audi’s Vision concept cars, while a rear light strip gives the GT a visual link with its e-tron SUV sibling. 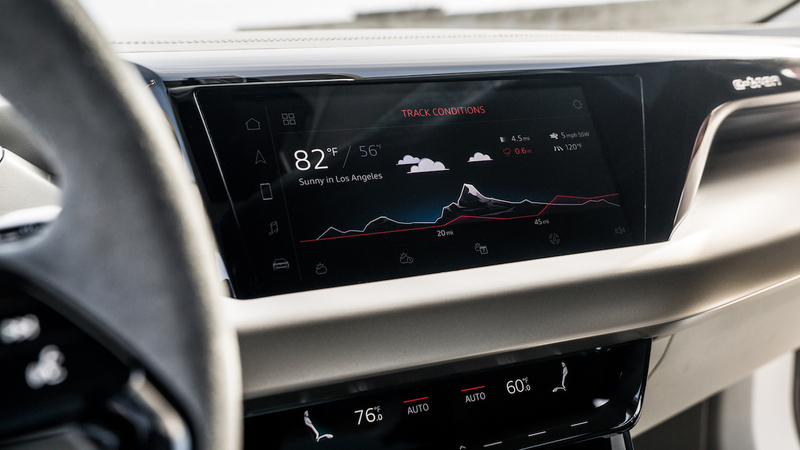 Inside, a set of performance-style seats face a high-concept infotainment setup, including a center-console touch screen with haptic feedback. The sustainability message carries to the materials covering the seats and touchpoints, which are synthetic-based and, as a press release points out, vegan, while the carpeting is made from recycled fishing nets. 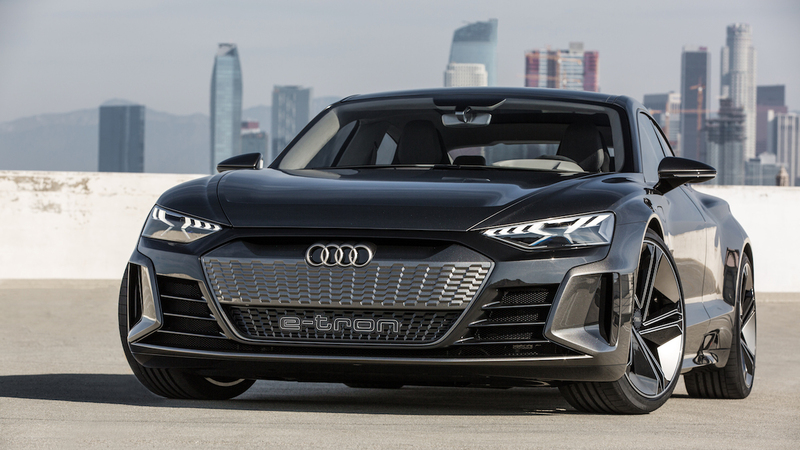 The grand touring segment is one of three Audi plans to insert E-tron EVs within the next three years. Audi’s already confirmed the e-tron SUV, with a starting price of $74,800, and a BMW X6-like e-tron Sportback will go on sale in 2019. 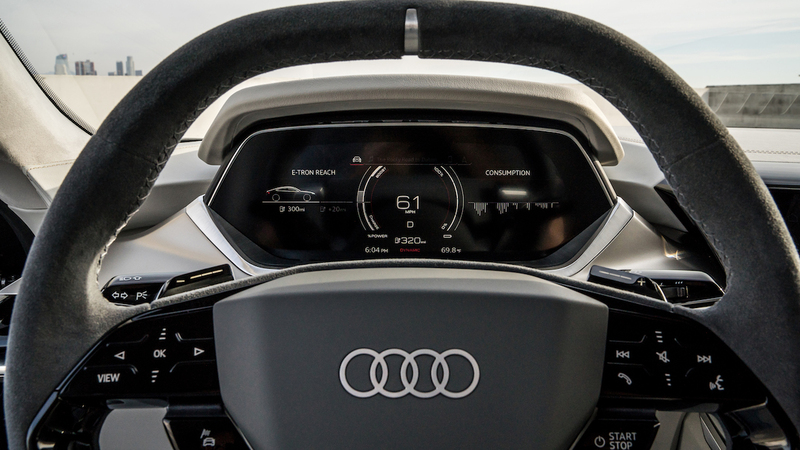 By 2025, Audi says, the brand will offer 12 electric or hybrid-electric vehicles in certain markets worldwide, reaching one-third of its global sales.